Please kindly note we have stopped manufacturing this product now. We recommend low cost ultrasonic flowmeter for substitution. The economic type is an ultrasonic flowmeter that clamps on to the outside of a pipe. It provides easy and low cost installation by clamping to the outside of existing piping systems.It is designed to replace mechanical flowmeters in applications where liquid conditions tend to damage or impede mechanical flowmeter operation. Though the economic ultrasonic flowmeter looks small, but it is very smart,and it can also support our various of flow transducers to meet different application. Its core part is the same as our main selling type flow meters. 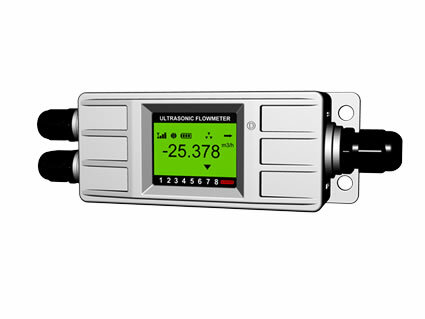 So users will have powerful digital ultrasonic flowmeter with a very low cost ownership. With a rugged metal enclosure, its water-proof protection class can reach IP68. 7)2×10 digit back-light LCD display. ※The time and corresponding flow rate of the last 32 times of power ON/OFF events. Allow manual and automatic flow loss compensation.